Iron Man 3 is one of Playtech’s many big money pokies, which runs on the Marvel Progressive Jackpot Network. 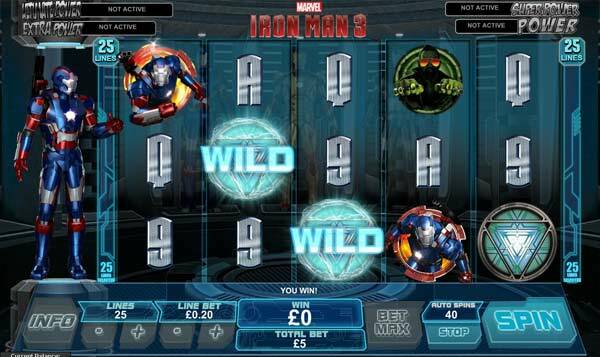 Iron Man 3 is the third pokie in the Iron Man franchise by Playtech, and is based on the hit movie of the same name. It contains less movie-related imagery than Iron Man 2, but a far better bonus round, which we’ll come to shortly. Iron Man 3 is played over 5 reels and 25 lines, with players able to adjust all of those individually if they wish. Players will only be able to adjust line bet, which can range from a low of 0.01 up to a high of 10.00. This gives Iron Man 3 a wagering range that starts out at as little as 0.25 per spin, but can rise as high as 250.00 per spin. Play with $3200 extra! Play Now! Wild symbol: Iron Man 3’s wild symbol is triangular in shape, and this emblem can replace all other symbols in the pokie, barring the Iron Man scatter. 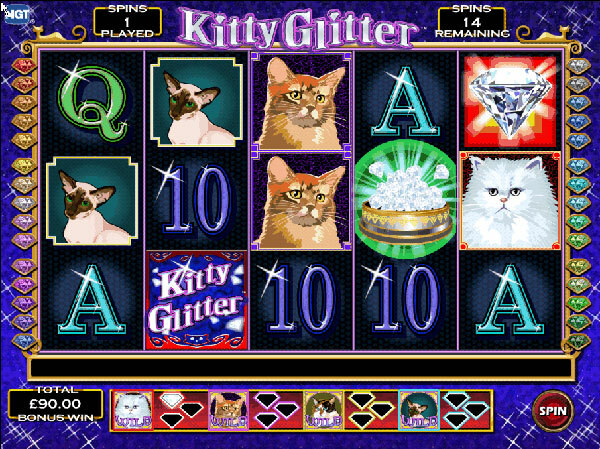 Wilds are capable of appearing on all of the reels in the game, and can offer winnings of up to 10,000 coins if 5 appear on any active line. Scatter icon: The Iron Man logo is the scatter in this pokie. It is also capable of appearing on all of the reels in the game. Should it appears 3, 4 or 5 times in any position on the reels, players can pocket scattered wins of 3x, 10x or 100x their total bet, as well as trigger the Hall of Armour bonus. All-Systems Go Re-Spin: Whenever a player lands the Mark 42, War Machine and Iron Patriot icons on the first, third and fifth reels at the same time, they will trigger the All-Systems Go Re-Spin. In this bonus, the player will get one re-spin, with all Iron Man armour suits counting as scatters. The symbols you used to trigger this bonus will remain locked into place for the re-spin. Wilds do not substitute for Iron Man armour suits during this bonus. Free spins bonus: The free spins bonus is called the Hall of Armour free games bonus. This is because players will get to choose one of three different armour suits to trigger the bonus. The Mark 42 bonus offers 10 free games with freezing wilds, whilst the War Machine bonus offers 8 free games with random wilds. Finally, the Iron Patriot bonus offers 15 free games with a dynamic multiplier. If players land each of their respective Iron Man suits on the third reel during this bonus, they will land 3 more free games. At any point in the pokie, players may be randomly taken to the Marvel Multi-Level Mystery Progressive Jackpot bonus. When there, they can choose from several symbols on the grid. Behind each one is a progressive jackpot. The first three progressive jackpot symbols that the player matches correlate to the progressive jackpot that they have won. Players can win either the Power, Extra Power, Super Power or Ultimate Power jackpots in this progressive jackpot pokie. 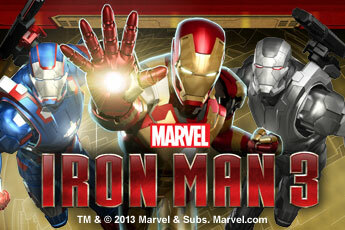 Iron Man 3 certainly has the best bonus round of any Iron Man pokie released by Playtech. Its progressive jackpot is actually the same as those that appear in all progressive jackpot pokies running on this network. Iron Man 3 is cheap to play, offers a host of top special features and can result in some really spiffy wins. 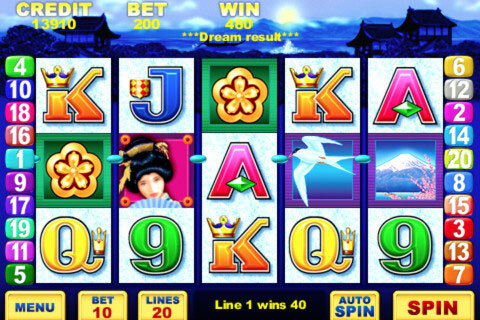 This pokie is suitable for all players.